to use a monogram on a project. Here is her creation for Quick Quotes!!! 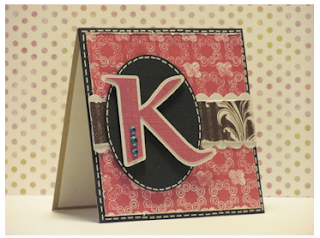 I used the Miss Morgan paper line and Bazzil card stock. 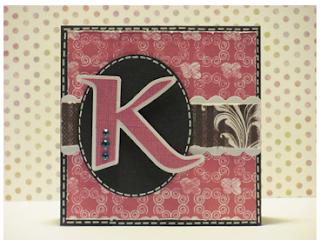 The card measures 4 ½” x 4 ½”. The oval is 3 ¼” tall and the “K” is 2 ¼” tall. Both were cut with Make-the-Cut. The turquoise jewels are from the $1 spot at Michael’s.